of the NYRR Manufacturers Hanover 5-Borough Staten Island Race At Clove Lakes Park. My goal was to run under 40 minutes and I ran 38:57, but Fred Lebow kicked past me at the finish! Fred befriended me after that and I got hooked on the running. I quit cross-country the next fall because I hadn’t run during the summer. But I still ran a 3-mile loop everyday after school on my own because I enjoyed it. 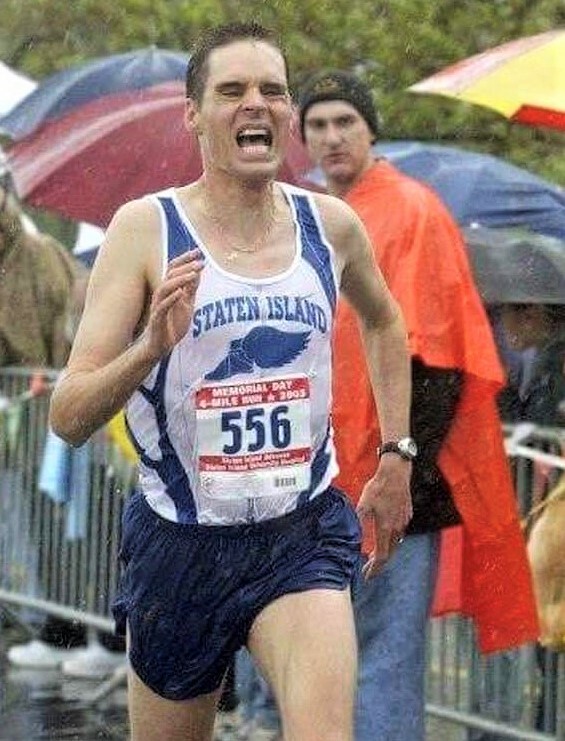 At that point 2 pivotal things happened-1) I learned about the Staten Island Athletic Club’s 3-Mile fun runs held every Saturday at Clove Lakes (a Tradition still continuing) and went every Saturday religiously. 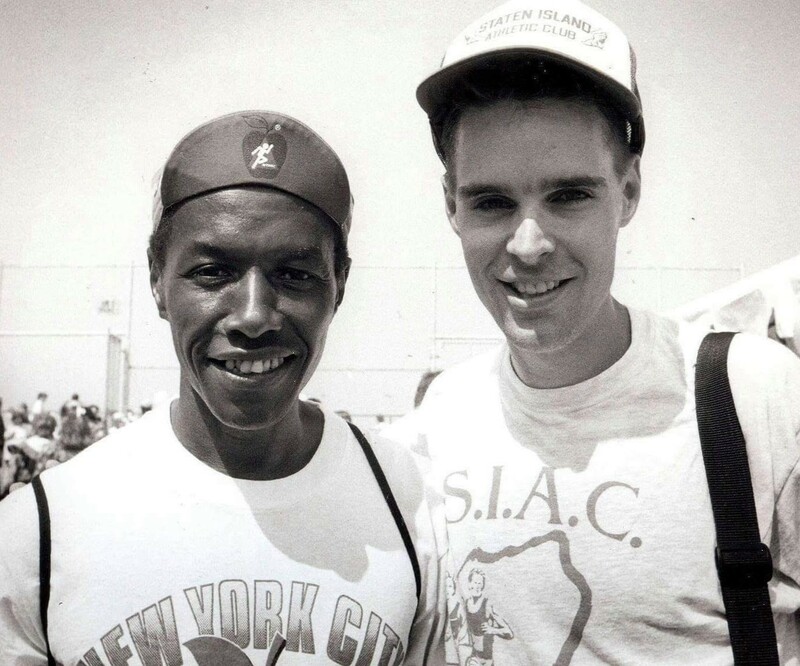 And I was introduced to the great Art Hall who got me to train with him on his North Shore Track Club. 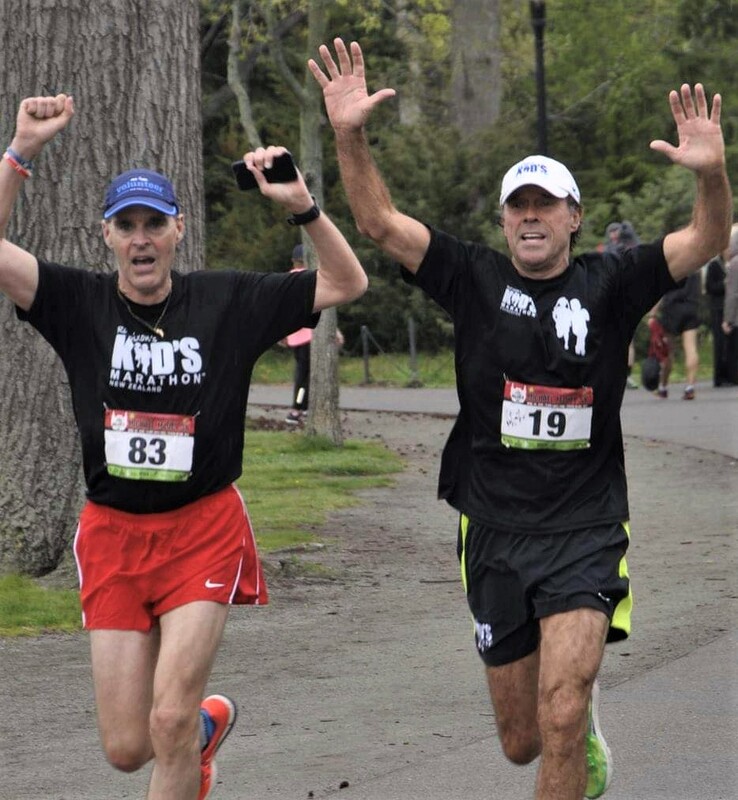 It was Art who showed me the lifestyle passion and approach to becoming a real runner. Going into my Senior year Art encouraged me to rejoin my Wagner HS XC team which I did. That fall of 1982 we won the NYC Public Schools Championships At Van Cortlandt Park, And I finished as the 5th man on my team that day. How much did you run in your peak years? That’s a funny question because every coach I ran under throughout the years emphasized the time duration of the workouts and not the overall mileage. Obviously when we did speed work on the track, we knew the distance but most of the runs were by time. I’d think that from 1987 to 1997 I probably averaged around 55-70 miles per week. Another important staple for me was the introduction of weight training as a beginning runner, which I still utilize consistently to this day. Please estimate your total lifetime running miles. I’ve probably run around 75,000 miles since 1981. Top races or running achievements? One of the stranger occurrences is that I began my running towards the end of the first “Running Boom” when quality performances going deep down in race results were the norm. I’ve sometimes found that as I’ve gotten slower, my places in races results have gone higher! Staten Island has an annual Thanksgiving Day run known as the Lou Marli run, named for one of our sport’s great local benefactors. In 1984, I ran 15:33 over the 3-mile course, finishing around 30th place here locally. But a decade later in 1994, my time actually won the race! 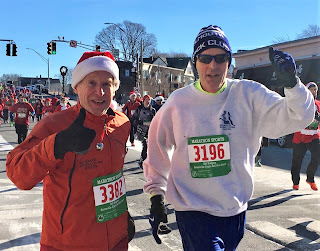 For the 1995 race, my coach at that time--2-time NYC Marathon Champion Tom Fleming--set up a year-long training program to attempt to run 15:20 on Thanksgiving Day. The program was perfect as I ran 15:21 and won the Lou Marli run. How much are you running and my cross-training now? These days I’m being coached by Olympic miler Jim Spivey. I’m running 6 days a week, but I also do some bike riding and pool running from time to time, and I’m still in the weight room 2 times a week. I’m probably running between 40-50 miles per week. Does it bother you to get slower? I’ve learned to just roll with the fact that I’m slower. I still set goals for myself that are within my possibilities. I also try very hard to convince myself that although your mind thinks it’s still really fast the body will tell you otherwise. I’ve been able to maintain motivation and passion because of all the people who guided me throughout my running career. 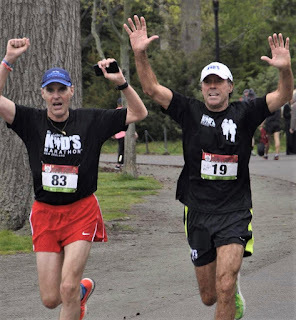 It’s been awesome and inspiring to befriend and go run with many of my running idols including Tom Fleming, Craig Virgin, Jim Ryun, Rod Dixon, Steve Jones, Frank Shorter, Seb Coe, Jim Spivey, Bill Rodgers, and others with a a great love and devotion to the sport. Art Hall used to say: “I don’t care if you’re a good runner...I first want a good person” and I’m happy to say that for the most part the great ones in our sport reflect that. How have your diet and weight changed? I’ve gained approximately 15 pounds since my high school days, but it does fluctuate a few pounds up and down depending on the time of year or what phase of training I’m in. I started getting somewhat nutritional back in 1988 when my performances weren’t up to par, but these days I’m much more vigilant. I eat red meat once in a blue moon, but I’m a big fan of fish, especially salmon and anything else. I do take a multi- vitamin with fish oil and I’m a big fan of bromelain. This last summer when I went to North Carolina for the Sir Walter Mile I came across an all-natural bar known as “Big Spoon Roasters”. I immediately became addicted and almost always have one post-run for recovery. My favorite flavor is Apricot Pepita. Injuries or other health issues? I’ve had my share of injuries throughout the years but always adopted an idea that “It comes with the territory.” Whenever Plantar Fasciitis, Piriformis, or Achilles tendinitis pops up, I immediately start pool running. 1984 Olympic trials Champ Pete Pfitzinger has a 10-week pool running program on the web which is highly recommend every runner to look at. I’ve also made sure to try and not change shoe models which has been a mistake of mine in the past. These days I’ve been finding that the ASICS Gel-Kayanos fit me like a glove. Your philosophy of life, running, and aging? I’ve always felt that Life is to be enjoyed and should have challenges to motivate a person. Running is an extension of that philosophy, and as long as I’m around and healthy I’ll continue to be just as committed and passionate about it. Aging to me is just a normal process which can be treated like a companion through one’s travels. Three short tips for those who would like to become lifetime runners? 1--Don’t specialize before high school. 2--Be patient and understand that running improvement demands long-term development. 3--Become a student of the sport. Reading and learning about other great runners doesn’t mean you have to match their training sessions but rather to match their psychological traits in their approach to training and racing.